Fabergé is one of the world’s most recognised luxury brand names, underscored by a well-documented and globally respected heritage. During the five-month period to 31 December 2017, Fabergé saw strong activity in agreed sales in both number of pieces sold at 710 and number of sales transactions at 383. Fabergé opened its first store in Texas, located in the Houston Galleria Mall, the state’s premier retail destination. Fabergé is one of the world’s most recognised luxury brand names, underscored by a well-documented and globally respected heritage. As a wholly owned subsidiary of Gemfields, Fabergé provides direct access to the end-consumer of coloured gemstones through directly operated boutiques and international wholesale partners, and boosts the international presence and perception of coloured gemstones through its consumer-focussed marketing campaigns. At the point of acquisition, Fabergé operated two directly managed points of sale, Grafton Street in Mayfair and a stand- alone counter in the Harrods Fine Jewellery Room. In October 2017, Fabergé opened its first store in Texas, located in the Houston Galleria Mall, the state’s premier retail destination. In support of the opening, Fabergé unveiled an exclusive locket pendant featuring golden Texan boots and a cowboy hat, an item which has become one of the store’s best-selling products and a favourite amongst the luxury media. In addition to its directly operated stores, Fabergé continued to expand its global presence during the period via new agreements with multi-brand retail partners. At the end of the year, Fabergé products were available in Australia, Andorra, Azerbaijan, Bahrain, Canada, the Czech Republic, France, Germany, Italy, Jordan, Malta, Qatar, Romania, Saudi Arabia, South Africa, Switzerland, Thailand, the UAE, the UK, Ukraine and the USA. The total number of Fabergé outlets increased from 39 to 49 during the period. Throughout 2017, Fabergé focussed on fine jewellery collections featuring coloured gemstones and high-complication timepieces with a blend of digital marketing and print advertising. Further information on the marketing and communications projects carried out by Fabergé can be found in the dedicated section in the Operational Review. Fabergé had revenues of US$3.4 million in the five-month period from 1 August 2017 to 31 December 2017. During the same period, Fabergé recorded an EBITDA loss of US$3.7 million, with average monthly operating expenses of US$1.0 million and a sales margin of 42%. Fabergé’s Visionnaire Chronograph, powered by the automatic calibre 6361, is a revolutionary new movement that provides unprecedented clarity, precision and efficiency to the highly popular chronograph complication. Nearly a decade of work and five horologically significant patents are deployed in the calibre 6361, two of which have been specifically designed for the new chronograph movement developed by Agenhor, the Geneva-based movement specialist. The watch was shortlisted for the Grand Prix d’Horlogerie de Geneve Prize in the Chronograph category. This timepiece will be in full production in the first quarter of 2018. Fabergé’s jewellery lines were expanded during the period to include bangles and cross-over rings, further building the customer offering based around the iconic egg shape. 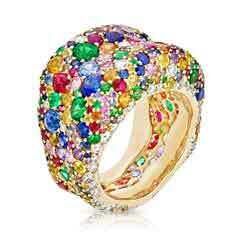 Fabergé’s development has continued with the opening of a new boutique in Houston. The luxury brand is focussing on achieving sustainable profitability for the business on a stand-alone basis. In 2018, Fabergé will continue its digitally led campaign, with greater focus on socially powered marketing given the reach, adaptability and measurability offered by that medium. The coloured gemstone-set fine jewellery collections will remain at the heart of the campaign, allowing Fabergé to seek and utilise synergies with Gemfields’ marketing and continuing to promote the brand’s tagline: A Life in Colour. Fabergé’s partner-operated mono-brand boutique opened in the prestigious Dubai Mall in March 2018. In addition, Fabergé has planned openings within multi-brand retail partner boutiques in Macau and Belgium and will continue to expand its global retail footprint, with further multi-brand retail openings in the US, Western Europe, the Middle East and South-East Asia. Gemfields plc (AIM: GEM), a global leader in coloured gemstone mining and marketing, is delighted to announce that Fabergé (which is wholly-owned by Gemfields) has won the prestigious Grand Prix d’Horlogerie de Genève (“GPHG”), the Swiss watchmaking industry’s highest honour, in the ‘Ladies Hi-Mechanical’ category with its ‘Lady Compliquée Peacock’ timepiece.